Are we living in an exciting age of innovation or the dying days of a globalised empire? In this series of three talks, comedian Jordan Raskopoulos, artist Fayen d’Evie and professor of Law Megan Davis share their unique perspectives on the times we live in. Inspired by the exhibition The National 2019: New Australian Art, this series examines states of anxiety, the instability of language and the reclaiming of First Nations histories. How do we reconcile the uncertain state of the world with our everyday lives? Comedian Jordan Raskopoulos delves deep into living with high functioning anxiety, bringing a personal perspective to one of the key themes of The National 2019; standing on the precipice of change. Jordan Raskopoulos is acclaimed comedian and 'Queen of the Internet’. She also moonlights as a singer, writer, filmmaker, digital content creator, journalist, advocate, influencer, speaker and masked crime fighter. She was recently named Icon of the year at the 2019 LGBTI awards. How do we convey meaning when words are inadequate? How do we experience the world through all of our senses? Hear from artist Fayen d’Evie, whose work in The National 2019 is read through sound, gesture and touch. d’Evie will be in conversation with artist and educator, Liam Benson. After the talk, she will perform her Sensory meditation score, developed with choreographer and dancer Benjamin Hancock—an interactive and meditative experience of the Gallery. Fayen d’Evie is an artist, writer, and curator based in Muckleford, Australia. Her collaborative projects resist spectatorship by activating diverse audiences in embodied readings of artworks. Benjamin Hancock is a Melbourne dancer and choreographer who has worked with Fayen on a number of projects including her work for The National 2019. This talk will be Auslan interpreted for deaf and hearing-impaired visitors. Aboriginal advocate and academic Megan Davis has dedicated her life to improving the rights of Indigenous communities globally. In a recent article, she writes “We don’t need platitudes about truth telling. 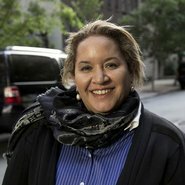 We need our allies to support hard headed structural reform so that the state is compelled to listen to the First Nations.” In this final talk in the Turbulent times series, Megan asks what it means to uncover and repair lost or hidden histories, touching on the issues explored by First Nations artists in The National 2019. Megan will be in conversation with journalist, radio broadcaster and writer, Daniel Browning. Megan Davis is a constitutional lawyer and Pro Vice Chancellor Indigenous and Professor of Law at the University of New South Wales. Professor Davis is also an Acting Commissioner of the NSW Land and Environment Court and an expert member of the United Nations Human Rights Council’s Expert Mechanism on the Rights of Indigenous Peoples.